The first time Archie and I visited Conti's several weeks ago, we didn't know what to try. I only know that their chicken pies and ensaymadas are to-die-for, but other than that, we were clueless. Relying on their "Must Try" dishes on the menu, we ordered a couple of dishes: the seafood au gratin and the Italian pasta. I didn't have my camera with me at the time so I wasn't able to take any pictures. So I guess, sans the photos, I'll have to defer my comments on the stuff that we tried, including the very delectable bananalicious pie. 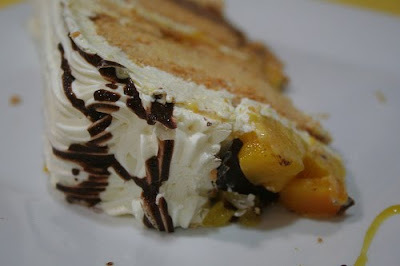 On our second visit, I still didn't have my camera with me, but this time we tried the Mango Bravo, and wow, what can we say? It was heavenly! The only thing I didn't quite like about it was the butter-based icing ~ I prefer sugar icing. But nonetheless, it was very wonderful, the best way to end a sumptuous meal.